The following description was taken from the Cape Scott – Winter Harbour Cottages website which can be found here. Winter Harbour BC is on the northwest coast of Vancouver Island, 75 kilometres (gravel road) west of Port Hardy. Approximately a 5 hour drive from Campbell River. Winter Harbour is also accessible by water, via Quatsino Sound, from Coal Harbour or Port Alice. In the 1930’s Winter Harbour was settled as a remote fishing community for west coast trollers. Having survived the ups and downs of the commercial fishing fleet, the village has evolved into a popular sports fishing destination. Fifteen minutes by speed boat puts fishers onto productive ocean fishing grounds. Salmon and bottom fish abound offshore as well as in the sheltered waters of Quatsino Sound. Winter Harbour is close to many wild, west coast beaches and hiking trails. Within the village, an historic boardwalk leads through the forest and along the shore. Nearby, Botel Park offers a rainforest hike from the community to an outside shore. Here is a picture of the InFORM sampling kit on the dock in Winter Harbour ready to be filled with seawater and returned to UVic for processing and later analysis. Results will be reported as they become available. 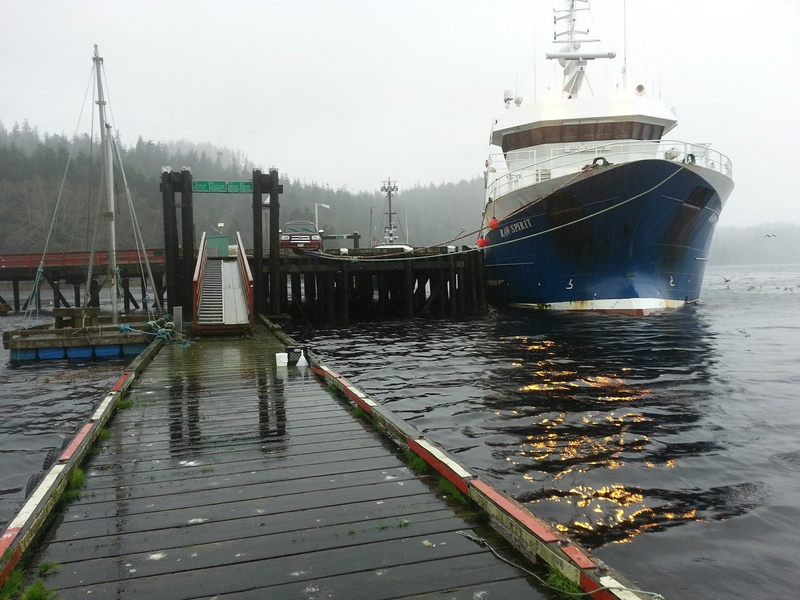 InFORM sampling kit dwarfed by the M/V Raw Spirit at the dock in Winter Harbour, BC Nov. 2014.